Shivani Sahasrabudhe (MeraNews, Ahmedabad): The noise of fireworks during Diwali might be a disturbance for humans, but for dogs, whose sense of hearing is far more powerful, the din is a more serious matter of concern. While human beings have a hearing range of 20 to 20,000 hertz, this goes up to 60,000 hertz in the case of dogs. “They start trembling. They basically get very anxious and can’t sit in one place. They can also become restless. 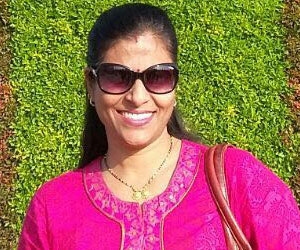 They’ll find a place to hide so they can get away from the noise,” she says, adding that pet owners approach her before Diwali with questions on how to deal with the effect of the noise on their dogs. 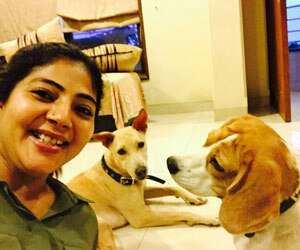 Giri says the effect on dogs varies—some get scared by the noise while others enjoy the bursting of crackers. “One should always be with the dog and make him feel safe. Usually, their routine changes, so you must feed before the noise of the crackers starts,” she says. “I’ve had a Husky for five years now. I would say one should stay with the dog so that it doesn’t get scared. We make sure that our dog sleeps with us so that he feels safe,” says Hiten Vasant, chief executive of the Vasant Group. 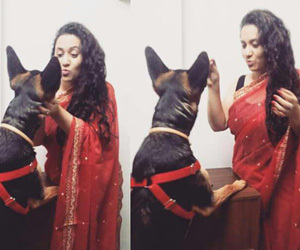 Zeal Jani Patel says she keep her Great Dane in a closed room or at her farm house during Diwali. “I also put on the AC so that the noise from outside doesn’t get inside... New year’s night is horrible as he has to bear the noise of crackers the whole night,” she says. The noise of firecrackers is not the only danger to dogs during Diwali. “During Diwali, we see many dogs with their back or legs burnt. Also, there are accidents involving stray dogs because of loud crackers being burst,” says Sherwin Everett, assistant curator at the Jivdaya Charitable Trust, an animal welfare organization. He recommends that owners spend as much time as possible with their pets. “Keep the dog with you or where your family is sitting. That will be more comfortable for the dog,” he says.